The Art and Literature Centre «Panselinos» was inaugurated on Wednesday, October 22nd, 1975 at 14, Chrystomou Smirnis str., in an underground space. It had an exhibition area of 186 m², a management office, a spacious storeroom as a depository for paintings, library and catalogues – informative brochures. It constituted the largest, at the time, exhibition place in town that could host numerous groups of visitors, students, pupils to take the tour, guided either by the artists themselves, or the art historians, but mainly by the professor of the homonymous Chair at the Department of Arts and Letters of the Aristotle University of Thessaloniki, Chrysanthos Christou. Christou, through the lectures he was giving at the exhibitions and the in-person acquaintance of the students with the artists, made a determinative contribution to the education and familiarization of the young public with the modern artistic expressions. 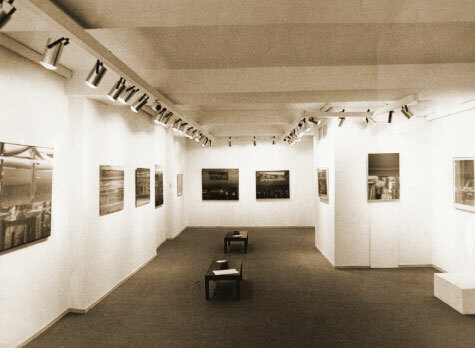 During the previous decade, the 60's, when the visual arts were established in Thessaloniki, the exhibitions' activity was increased (over 300) and was forwarded by various parties - mostly by the Macedonian Artistic Company «Techni»– and paved the way so that the institution of galleries would be established in the city. Thus, Thanassis Bakogriogos with the experience from his cooperation with Greek galleries in London still fresh, decided to organize his own space, which along with «Kochlias», the neighbouring gallery of Costas Lachas, became a milestone in the evolution of visual arts, not only because they were purely art halls (there were other galleries in the city but were housed under the same roof with bookstores or interior decoration shops), but also because they were based on thorough, quality planning. Bakogiorgos made sure to include every year in his programme one private sculpting exhibition (e.g. T. Papagianni, T. Kyriazopoulos, K. Roccos, G. Chouliaras, A. Oudinoti, M. Tzombanaki, A. Karibaka – Negreponti, K. Doboula, K. Kabadaki) and one for gravure (J. Drossos, V. Semertzidis, A. Nedelkou, - Seremeti, A. Tassou, T. Katsoulidis, R. Sarelakou). With the photographer Spiros Meletzis. «Panselinos», 1978. Many of the 80 artists who exhibited during the 13 years of the Centre's operation, were presented two and three times (N. Chouliaras in 1976, 1978, G. Nikolakopoulos in 1975, 1978, 1983, A. Tsirogiannis in 1976, 1981 etc. ), a fact that confirms that «Panselinos» created bonds of cooperation but also steady representation of the work of each one in the rich depository. Also, foreign artists such as R. Brandner, J. Corbidge, M. Frommel, Hilmar, Gottesthal were included in the annual exhibitions. Few, but of special interest, were the exhibitions of photography such as those of Spyros Meletis, Milton Rogovin, the New British Photographers. A special and unique, at the time, contribution in the area of inter-cultural communication were the exhibitions of Balkan artists. The first exhibition of Polish Posters (1975) had a great success, was inaugurated by the Minister of Northern Greece, N. Martis and the Polish ambassador Yan Bitsima and gave the opportunity to the public of Thessaloniki to be introduced to the history of the evolution of the arts in a country with special achievements in graphic arts. 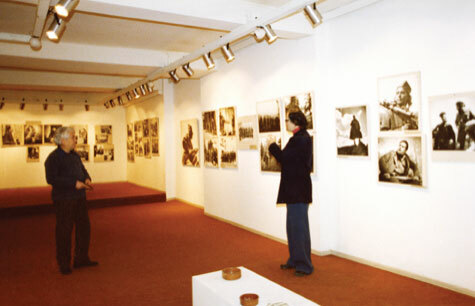 In 1978 the exhibition of Romanian Artists followed, in 1979 of Modern Bulgarian (painting – miniature sculpture), in 1981 of Albanian and a group exhibition of Soviet painters. Artists from Athens and Thessaloniki were taking turns mostly through private exhibitions, the number of which varied from 8 to 12, covering all the stylistic trends and were accompanied by informational brochures. In 1987, when the number of galleries had significantly increased in Thessaloniki, the operation of «Panselinos» came to an end, giving its place to a more personal place, the «Porfyra».